In a small bowl, whisk 2 Tablespoons of the milk with the cornstarch. Mix well to get rid of any clumps. In another small bowl, whip goat cheese until smooth. Whisk 1/4 cup of the hot milk mixture into the goat cheese until smooth. Pour the goat cheese mixture into the hot milk mixture in the large saucepan and whisk everything together until smooth. Add salt and rosewater. Mix well. Place the prepared geranium leaves into the bowl of a large stainless steel bowl. Pour the ice cream batter over the leaves. Mix gently. Cover and chill for 8 hours. Once the 8 hours is up, remove the rose geranium leaves and discard. Freeze ice cream batter according to manufacturer’s directions. Process until the ice cream is very thick and frozen (approximately 20 minutes.) Transfer to a freezer-safe container with a lid. Freeze for 4 hours. Scoop out and serve in teacups with roses on them. 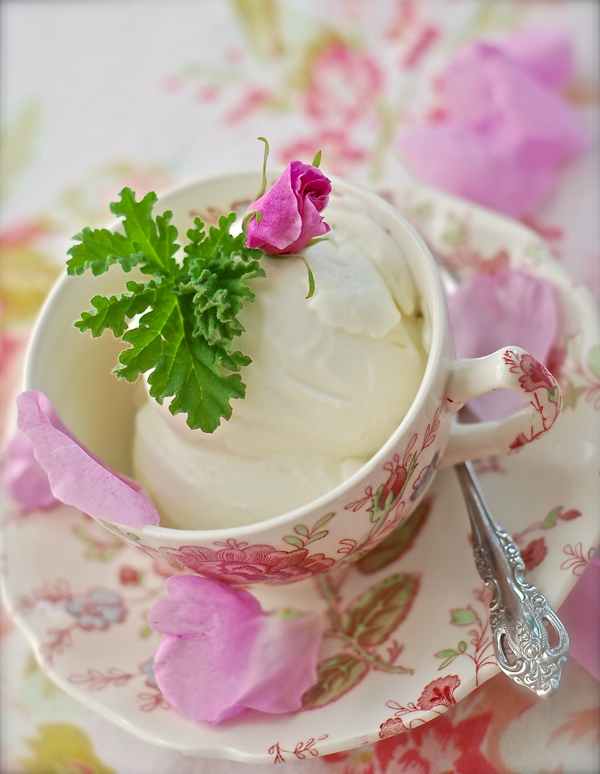 Garnish with fresh, washed rose geranium leaves, rosebuds and fresh, washed rose petals. What a wonderful trip Melissa and cant wait to see your tressure. What I love about you sweet friend ( amongst tons of other things) is you just like me love useing roses in cooking. Pinning! I love the exotic flavor, and I would never have thought about using geranium!